No longer working from a London office, I’d almost forgotten the sad sandwich scene. I haven’t ever been that keen on sandwiches for lunch in winter. Tiny finger sandwiches with afternoon tea and a range of lush fillings are great, but at lunch I’d rather eat something warm. So, it was with a sense of apprehension that I agreed to a trip to check out Spianata, the city’s first Roman bakery. I needn’t have worried. 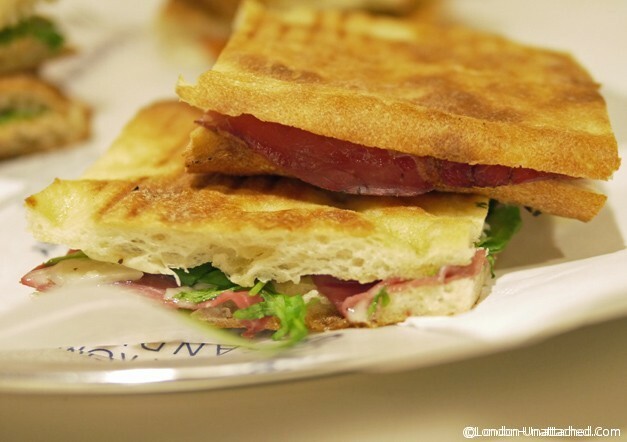 Although the special bread for the Spianata sandwiches is freshly baked each day, the sandwiches themselves are served hot. And they are nothing at all like the sliced white offering you’ll find in the local supermarket. The Spianata bread (Pizza Bianca Romana) is stone-baked in the company’s own bakery and when it comes out of the oven is a long (2 metres) flat piece of bread(spianata means ‘flattened’) that looks like a thick pizza base or thin foccacia. The central bakery delivers to each of the sandwich shops where the sandwiches are created by slicing the bread and filling it. When we arrived most of the sandwiches were made and pre-packed, ready to be heated up for serving, but I was told that the Mayfair branch I visited was about to change to making all their sandwiches to order. And to be honest, since the bread is delivered in the morning up to 11am ready for lunch service, it makes far more sense – as well as highlighting the freshness of the produce. 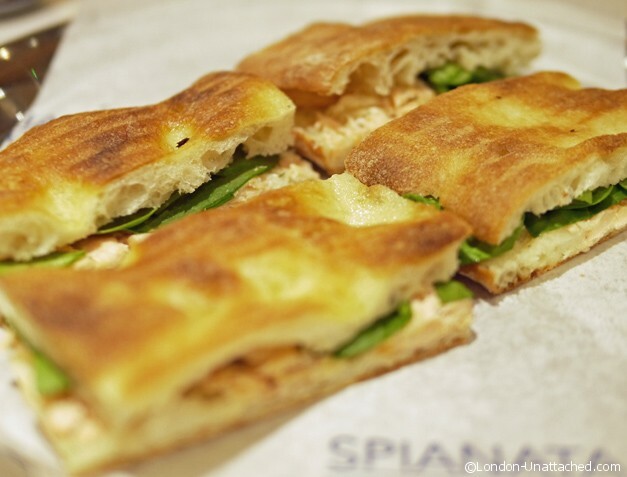 We tried a whole selection of Spianata sandwiches. Of course I loved the bresaola, rucola and grana with wild rocket and a lemon and olive oil dressing, but to be honest, the caprese, with mozzerella and tomato was every bit as good. The ultra fresh bread has a crunchy crust and soft middle. 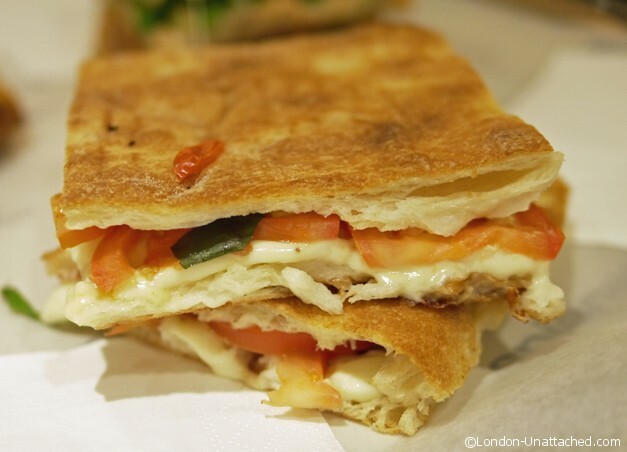 It works exceptionally well with the generous helpings of high quality fillings used in each sandwich. Our lunch was washed down with a selection of san pellegrino fruit drinks that I’d never seen before (though I do like the mineral water). Most were delicious but I wasn’t a great fan of the bitter chinotta which is made from chinotto oranges, grown at the foot of the Etna volcano in Sicily. I did really like the unlabelled bottle of something called cedrata, from another little known citrus from originating in the Calabria region, which is sweet and slightly gingery. 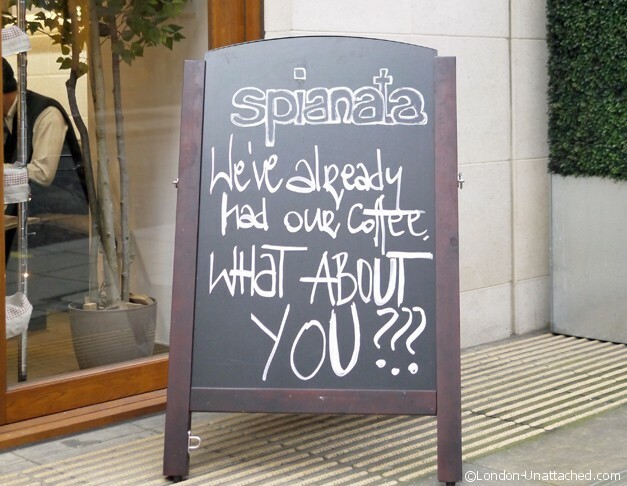 Spianata also serves salads and a few hot dishes each day. 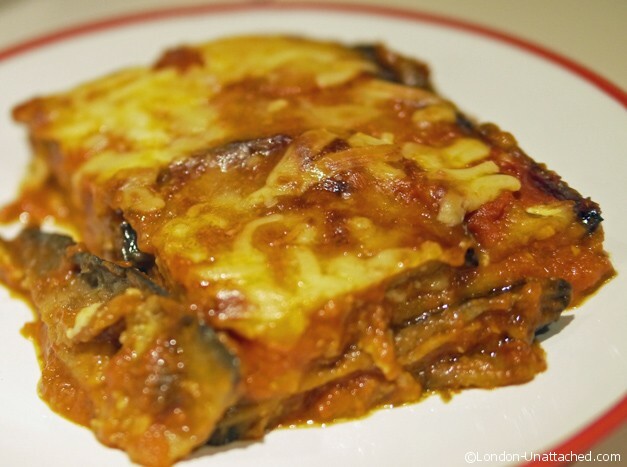 My companion enjoyed a Parmigiana di Melanzane which looked delicious. 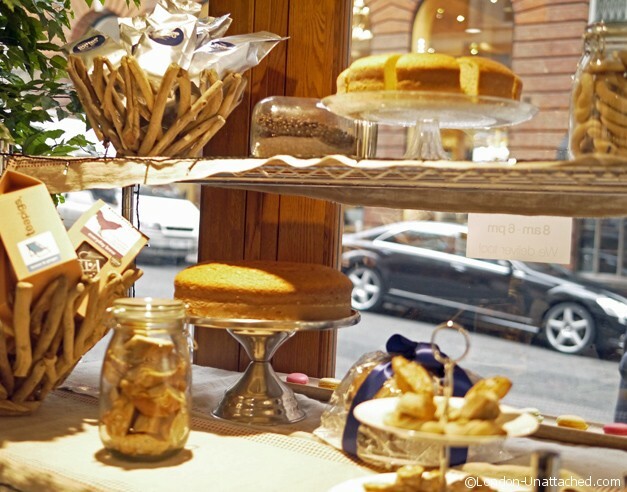 And a small range of desserts and cakes. 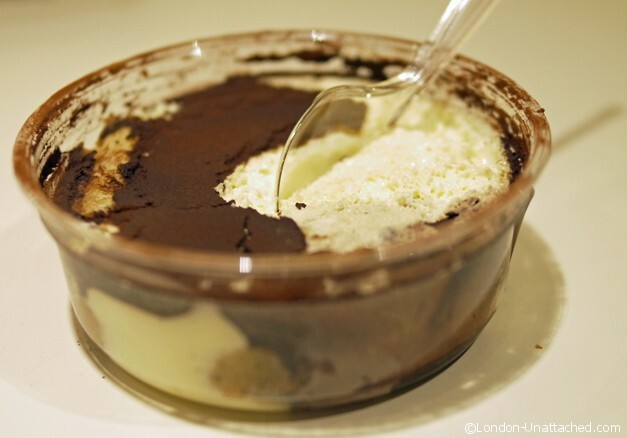 I think I won out over my companion who picked the tiramisu, which was pleasant enough but for me lacked the kick of a good dollop of alcohol. 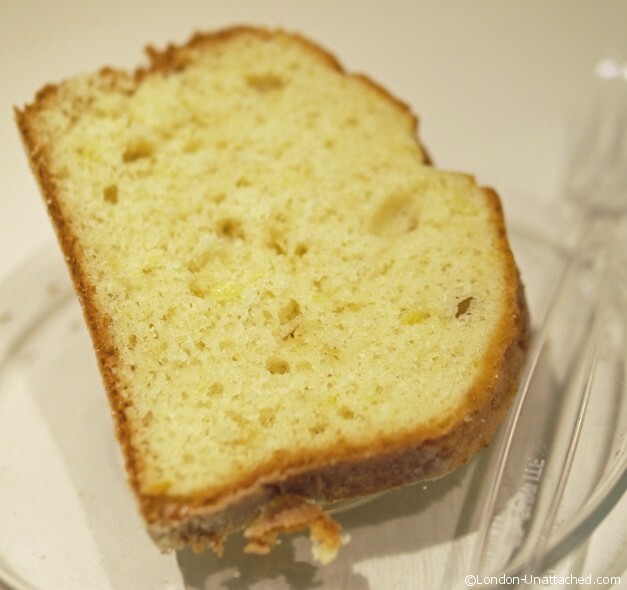 Instead I had a portion of lemon cake (ciambellotto) which the manager was at pains to stress was made with real freshly squeezed lemon juice and zest. It was light and fragrant, the perfect accompaniment to a strong coffee. Thanks for posting this review, I’ve been wanting to try here for ages! Looks so yummy. That looks all very delicious. It’s the advantage of living in a place like London. There you have so many lovely opportunities to get food. My selections around here is so good I rather do all my meals myself. aaah these look amazing! I don’t particularly like to buy prepacked sandwiches for lunch as its not really worth the money, but these look amazing, must find Nottinghams equivalent haha 🙂 lovely photos! It is all about the crustiness..These look really good. I bake bread all the time so look for new and different ways to use it. I had never heard of those chinotto waters either..I believe I would like that. Oh my god, this place looks incredible! I love flatbread sandwiches.